I swear… perusing Pinterest for healthy snacks for kids makes me feel like an awful mom. All these cute little creations that obviously take loads of mom time – when I can barely keep the kitchen floor clean and throw a frozen meal into the instant pot for dinner. I’m not putting candy eyes on a strawberry – I’m just not. Nor will I parade junk food (I’m looking at you pizza sticks) as healthy just because my kids would love it. Just yesterday, as I researched this post my nine-year-old daughter looked over my shoulder and searched the after school snacks on pinterest. I just stared. Ooh…that crossed the line. Thankfully (for her)… she was joking. But what do we do as moms? Do kids really need to snack? How do we handle it if they are hungry before dinner but we don’t want them gorging on junk food? That’s why we need a list of quick, easy and healthy after school snacks for kids. Snacks that require zero prep and will satisfy our kids hunger without them wanting more. What makes a healthy kid snack before dinner? Many snacks for kids are loaded with extra sugar. While they might taste good, they make kids crave more and more – leaving them unsatisfied and irritable. The foods on this list are low and sugar and most are high in protein. To keep kids satisfied mix and match fruit with a cheese or meat. This will keep them fuller for longer as well as provide the optimal nutrient balance. Tons of options right? And absolutely no googley eyes required. 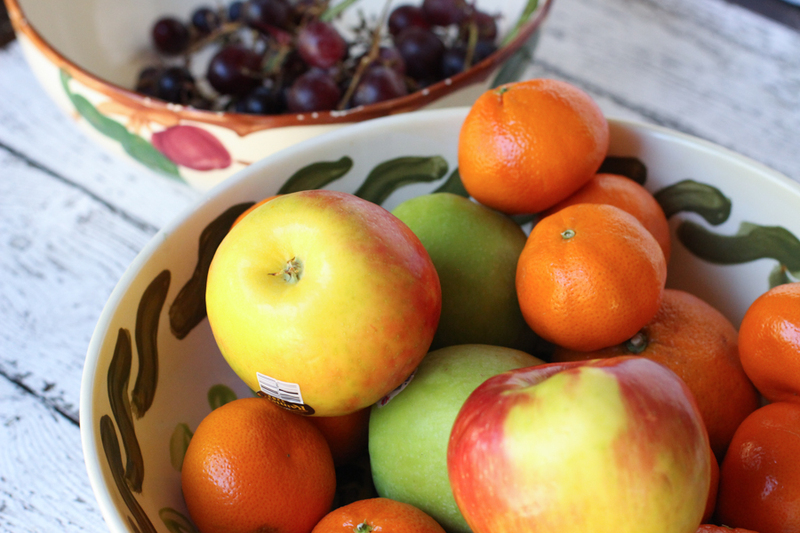 The fruit bowl – We have two bowls of fruit on our kitchen table. One is filled with apples and clementines, the other with grapes. We found that when our kids (and we) see the fruit, we’re more likely to choose it as a snack. The snack shelf – This is completely self serve and stocked only with items I’m ok with the kids eating. Everything else we keep on the appropriate shelf in the fridge and our kids ask before taking one. Usually, I stop all kid snacks an hour prior to dinner. I find that it the optimal amount of time for them to come to the table hungry. Do kids really need to snack? One healthy snack immediately after school should satisfy kids before dinner. As long as they choose something off this list – and don’t have access to anything additional – I find that my children will eat their meal without much prodding or complaining. Kid snacks do not have to be complicated. You don’t have to go to any extreme effort to get them to eat. Know that kids will eat healthy when they are hungry. If they aren’t hungry for a piece of fruit, they’re not really hungry. I know how persuasive they can be and how guilty moms can feel. But trust me, you do not have to make Pinterest worthy after school snacks. Hi! This list sounds absolutely great! I love many of the ideas and I am with you on getting kids to eat healthier after school. We do the bowl of fruit on the table too and they do eat it if they see it. I tried to get the list emailed to me, but it wouldn’t work, after I entered my email and my name, a page came up that said, The page I am looking for is not found. I tried a couple of times. I would really love the list cause it has so many great snacks listed! I don’t know why the page came up like that when I entered my info. Weird. Anyway, I got the list and it will be making it’s way to my fridge soon!